Central Government’s recent announcement of 7th Pay Commission might’ve brought smiles on the faces of five million central government employees, but it has brought resentment to more than 60 million farmers of the country, who have now decided to block the implementation of new pay commission until their demands are met. About 60 farmer associations of the country have demanded the government to put implementation of 7th Pay Commission recommendations on hold until it fulfills the promise of providing at least 50% profits in Minimum Support Price (MSP) to farmers. A resolution to put this demand before Centre was passed at a national-level convention of “Kisan Ekta” confederation in Bangalore on Wednesday. After completion of convention Food and Agricultural Policy analyst Mr. Devinder Sharma said in a meet-up with journalists that such benefits should be provided to farmers as well, who constitute more than 50% of Indian population. He added that government has no right to provide such a benefit to only one section of society. Speaking further on the topic of MSP Sharma said that the increase they’re demand was originally recommended by an expert committee headed by well-known agricultural scientist Dr. M.S. Swaminathan, but Centre is deliberately keeping the MSP at a low level because it may trigger inflation. Sharma has played a key role in bringing all these farmer associations together under the umbrella of “Kisan Ekta.” Currently members of this confederation have decided to send a formal letter to Prime Minister to inform him about their demands. The next course of action will be decided after seeing the response of PMO. While their demand makes sense, it’ll be wrong to declare that government has not done anything for farmers after coming to power. 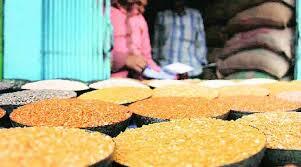 In the month of June it hiked MSP for certain farm products like paddy and pulses by Rs. 50 per quintal, an increase of 3.7%. And while farmers found this hike rather modest in comparison to 4% hike that UPA government did for last two years, economists have said that the hike was inline with expectations. Then in July BJP government in Mumbai made the decision of extending MSP coverage to dairy farmers as well. Demanding something from that’s rightfully yours is certainly not wrong, but holding the rise in income of government employees is unlikely to solve the problem. It’ll be interesting to see the developments that take place after this incident.